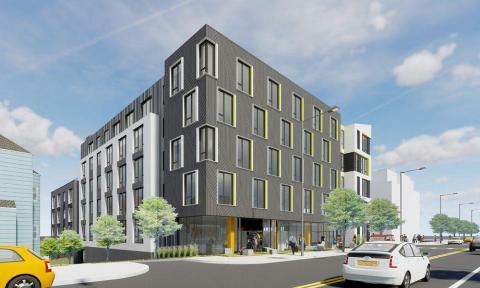 Boston real estate investment firm and landlord Mount Vernon Co. is seeking city permitting for a five-story, 74-unit apartment building in Boston’s Allston-Brighton neighborhood and a separate four-story building with nine condos across the street. The apartments at North Beacon and Everett streets would be middle-market-priced units, according to Mount Vernon founder and Chairman Bruce Percelay. The condos on Sinclair Road likely would run for $600 to $700 per square foot, which would put them “dramatically below pricing outside the Allston market,” Percelay said. “We’ve have owned the property for a long time, and we’ve seen the area improve substantially, but most noticeably with the addition of the (MBTA’s New Boston Landing) commuter rail station, which is within easy walking distance of this location,” Percelay said. The project sites currently are occupied by a vacant two-family home formerly used as a rooming house and a 2.5-story, four-family home. Both would be demolished, according to the letter of intent that Mount Vernon submitted to the Boston Planning & Development Agency. Studio to three-bedroom apartments and one-bedroom and one-bedroom loft condos are planned. Amenities would include parking for 42 vehicles, storage for 83 bicycles, a rooftop outdoor area, fitness center and art gallery space. Cambridge-based Prellwitz Chilinski Associates Inc. is Mount Vernon’s architect for the project. Over the past 30 years, Mount Vernon’s portfolio has grown to about 1,600 apartments, five hotels and some commercial and vacation properties, according to the company’s website. It has offices in Boston and Nantucket.